Overview (No Spoilers): Gillian Flynn weaves another dark and thrilling mystery in Dark Places that catches a firm hold of the reader throughout the winding twists. Similar to Gone Girl, Flynn alternates between the dark perspective of Libby Day, a grown woman who was the sole survivor of a gruesome crime as a young child, to the perspectives of Libby’s mother and brother on the actual day of the terrible murders. The suspense mounts as Libby’s search for the truth progresses closer and closer to the answer, while the reader is simultaneously following the events of the ill fated day. 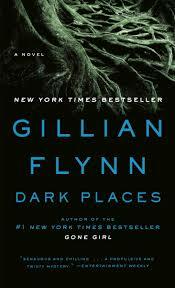 Dark Places is comprised of unique, dark characters who bring the story to life with thrilling twists, which will keep readers on the edges of their seats!